Aubrey Mead, of Greenwich High school, and Elizabeth G. Block, of Bulkeley High school, Hartford, were among the Connecticut state prize winners in the list of 400 selected from more than 30,000 student entries by the judges in the National High School Awards, 40 South Third Street, Columbus, Ohio. This annual scholarship contest brings together the best short stories, essays, poems, articles and plays written by students in High schools throughout the country. The Greenwich and Hartford pupils have submitted the best one-act plays. 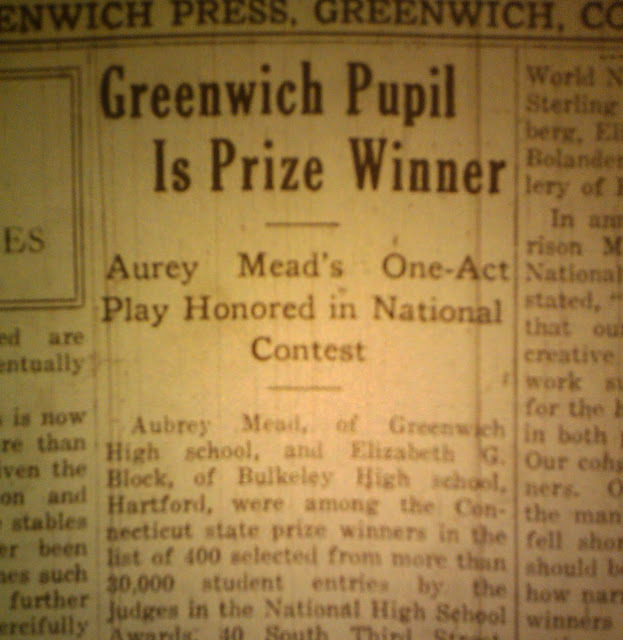 The other Connecticut state prizes were awarded to Rachel Mittlestein, Commercial High School, New Haven, for the best short story; to Minter Somersville, Miss Porter's School, Manchester, for the best poetry; to Elizabeth Hendee Rice, Oxford High School, Hartford, for the best book review; to Clayton Hansen, High school, Manchester, for the best sports story. The three national prizes for the short stories were won by Frances LaPorte, St. John's Cathedral High, Fresno, Calif.; John Moomaw, Central High School, South Bend, Ind. ; Constance Olsen, High School, Stoughton, Wis. In the essay group first prize was awarded to Sophie Fox, High School, Webster Grove, Mo. ; second prize, to Ferne Quillen, High School, Pontiac, Mich.; third prize, to Andrew Hilen, Garfield High school, Seattle, Wash. In the field of poetry the national prize winners included Margaret Demorest, Scott High School, Toledo, Ohio; Dorothy Price, Central High school, Tulsa, Okla.; and Elizabeth Snell, High school, Oak Park, Ill. The contests were jointly sponsored by a group of leading standard magazines. The jury of awards included the editors and representatives of the Atlantic Monthly, Bookman, Current Literature, Forum, Harper's, Ladies Home Journal, Saturday Review of Literature, Scribner's, World's Work, World News and Elsie Singamaster, Sterling A. Leonard, Max J. Herzberg, Elias Liberman and Karl S. Bolander, Diretcor Columbus Gallery of Fine Art. In announcing the awards, Harrison M. Sayre, Director of the National High School Awards, stated, "This contest clearly shows that our schools are developing creative minds. The quality of the works submitted speaks volumes of the high type of training given in both private and public schools. Our congratulations go to the winners. Our honest complements to the many contestants whose work fell short of winning a prize. It should be a consolation to know by how narrow margin some of the winners excelled losers. The nation-wide endorsement given to this scholarship contest has been so enthusiastic that I am glad to announce that the National High School Awards will be continued next year." In addition to the cash prize to each winner, handsome loving cups will be presented to the schools attended by the first and second prize winners in each contest.